Visit the website www.contemporaryartgallery.ca; all public events are free and suitable for a general audience. 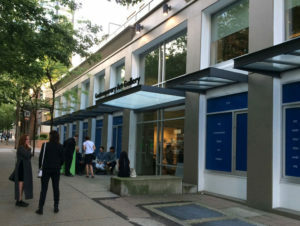 Vancouver – May 2016, The Contemporary Art Gallery (CAG) presents the first major museum exhibition in Canada devoted to the well-respected German photographer Jochen Lempert. Trained as a biologist, Lempert photographs plants, animals and other natural phenomena with both scientific acumen and a poetic appreciation of natural beauty. His approach is scientific, as well as humorous. Always working in black and white, his work engages with a diverse range of subjects and genres, ranging from every day views to abstract details. Photographic series alternate with single pictures, highly contrasted images with almost blank papers, through which multiple links and subtle associations are woven. The exhibition, entitled “Field Guide” will be shown from May 7th to July 17th in the BC Binning and Alvin Balkind Galleries and focusses on a range of work produced over the last five years that has direct resonance with photographic practices in Vancouver. The subject of interest of Lempert’s work is complemented by his exploration of the properties and materiality of the photographic image, as revealed in its developing and printing process. While seemingly serendipitous, Lempert pursues a very clear goal and aesthetic. His is a careful, subtle world. The first thing one might notice about his photographs are their physical presence. He often manipulates them as he processes them in his darkroom and a picture may be printed in four different sizes before the artist settles on which works best. Lempert’sphotographic series depart from similarities based on form; his morphological inventions open up different possibilities. Lempert, working with nothing more than a 35 mm camera, often tries to photograph phenomena that elude our visual grasp – great spans of time, the complexity of interacting natural systems, invisible biological processes. A sense of wonder at the world’s mysteriousnessrushes into the gap between the artist’s grand intentions and the humble means which the expresses them. 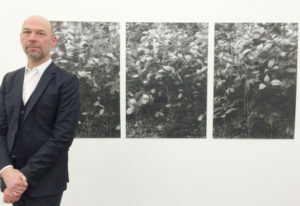 Jochen Lempert, Field Guide, exhibition opening, Contemporary Art Gallery, May 7 to July 17, 2016. Photograph by Trasi Jang. The German Consulate generously supported a preview reception on Friday, May 6th with guests from the German Community and the Art Community in Vancouver. 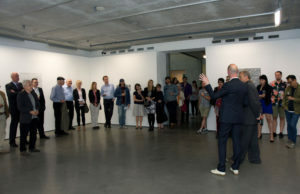 The Gallery was then opened to the public and the space was filled quite quickly with media, art lovers and visitors, all eager to meet the artist and learn more about his work. In my conversation with Jochen Lempert he told me he planned a trip to Vancouver Island, exploring the coast, he planned to go and see where the adventure took him. I, of course, told him about places like Tofino, Savary Island and sights not to miss in Victoria. Jochen Lempert also gave an “Artist Talk” on Saturday, May 7th at 2 pm, while Claudia Beck, an art collector and writer, will lead a talk on Saturday, June 11th, at 3 pm. This event is free and suitable to a general audience. On Saturday, May 28th from 12 to 3 pm, there will be a Family Day event entitled “Plant Patterns”. Participants of all ages can use crayons to create rubbings of leaves, features and other natural materials to create a collage. Guided, hands-on-exploration of Beaty Biodiversity Museum fossils and specimens will also be offered. The final event will be Saturday, June 25th from 12 to 3 pm. These events are generously supported by the Hamber Foundation. Information is found here: http://www.artstarts.com/weekend. 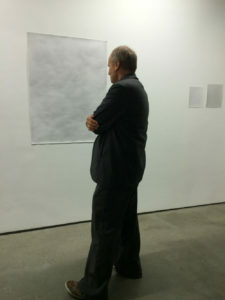 The Contemporary Art Gallery (CAG) is a non-profit public art gallery dedicated to the research, exhibition, education and documentation of contemporary visual art as it is practiced locally through to internationally. It aspires to generate significant audiences for its innovative and diverse programmes through free access and a profile that is international in scope. – here is also a free guided visit by Director Nigel Prince on Saturday May 28 at 3pm, that might be of interest to art and nature lovers.